Here are some other avian highlights. I'll be brief today since Blogger is still playing a tattoo on my ability to upload photos (or fix typos). Besides, isn't it wordless Wednesday? 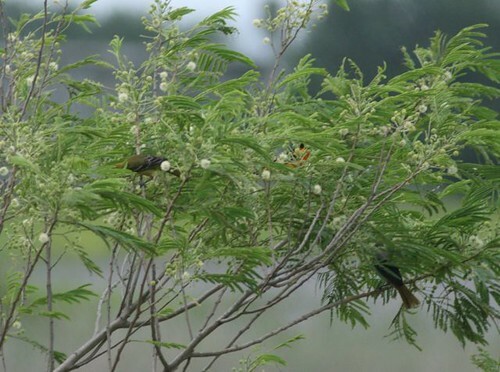 On South Padre Island in spring you see lot of trees and shrubs with several birds in them. This tepeguaje has three orioles in it—at least. 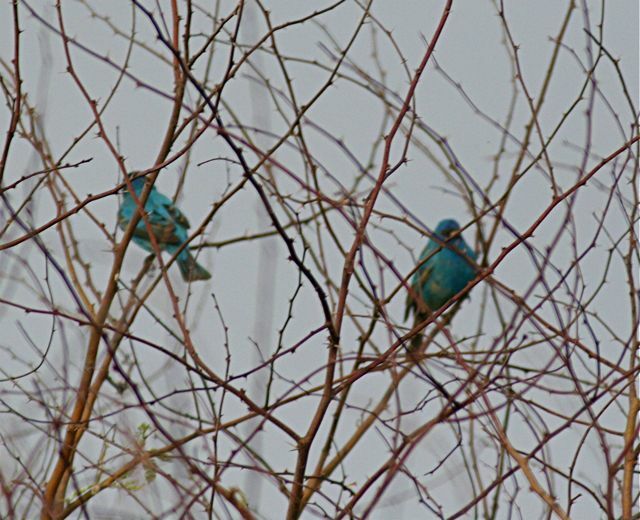 The indigo buntings were dropping into the bushes in twos and threes. 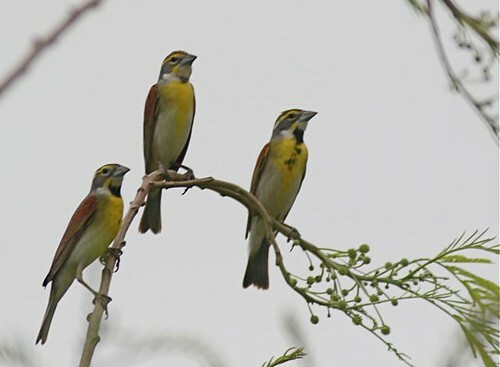 Hundreds of dickcissels passed through during the night and day. These three paused for a photo. This great-tailed grackle gave me the creeps. Wonder why? 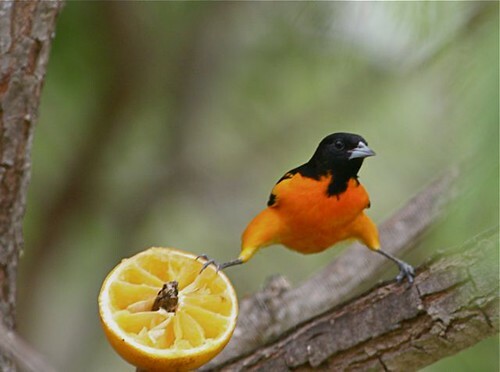 The oranges we put out proved irresistible to this male Baltimore oriole. Looking out onto the bay we saw an ever-changing cast of birds. 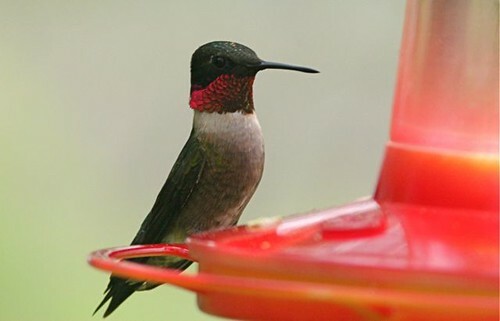 I can never resist the chance to take photos of ruby-throated hummingbirds. 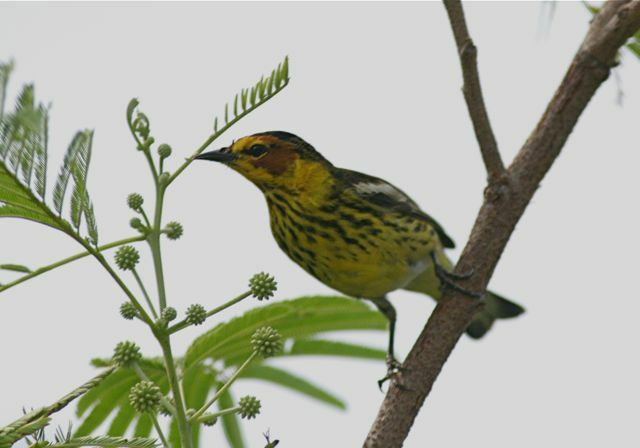 A curious Cape May warbler peers at me from a mesquite. Because of its location along the Texas Gulf Coast, South Padre Island attracts certain creatures: spring break revelers from college, surf fishermen, boogie board addicts, sun worshipers, and migrant songbirds, and the birders that chase them. 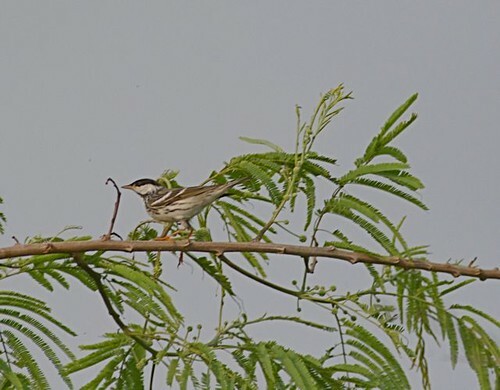 Among the birds that pile up on South Padre in the spring, no group gets as much attention as the warblers. The convention center on the northern reaches of South Padre has a brackish marsh and several lines of trees. These are the first land-based features that migrant warblers see when the come across the gulf from Mexico on their all-night flights headed northward. So the birds drop out of the sky seeking refuge and head for the biggest clump of trees in sight. Waiting for them are the birders and photographers. On a good day you might be able to catch 30 warbler species there. The trouble is that a good day for the birders is when the winds howl out of the North, forcing the birds to fight all night across the gulf. 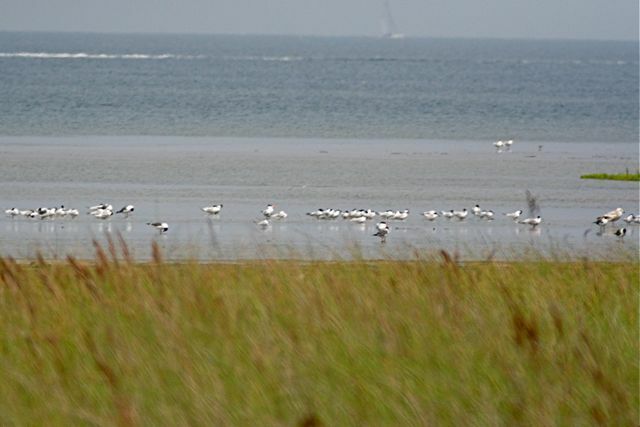 Many of them reach land just barely, dropping exhausted into the trees, onto the beaches, sometimes lacking the energy to begin foraging right away. So a good day for birders is often a bad day for the warblers. While doing our Big Sit from midnight to midnight last Sunday on the back side of the South Padre Convention Center we heard rumors of a north wind bringing a storm front across Texas. This would be good for birds if it arrived at the right time. Well lucky for the birds, it arrived too late to inhibit migration. 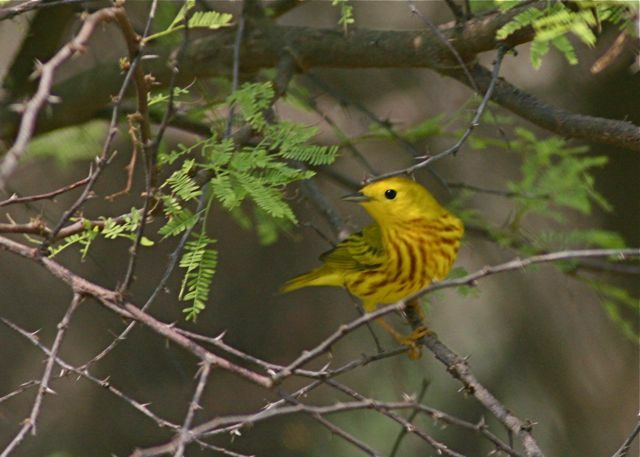 Unluckily for us we did not get the huge fallout of warblers that the Texas Coast is famous for having. Still The Groovy-billed Anis (our Big Sit team) eked out a respectable 17 warbler species, the last two (a bay-breasted and a magnolia) right at dusk in pounding rain. More on the rain in a future post. Here are some of the visual highlights, warbler-wise, that I was able to capture in between bouts of Big Sitting. I should note that these images are barely cropped if at all. The birds were VERY close, coming in for sips of water and for the insects sheltering in the trees. Tired migrant birds are less spooky and wary which explains why there were at least a dozen photographers there with their big rigs, shooting warblers. Tennessee warbler reaching for a tasty morsel. Yellow warbler looking happy to be on land again. 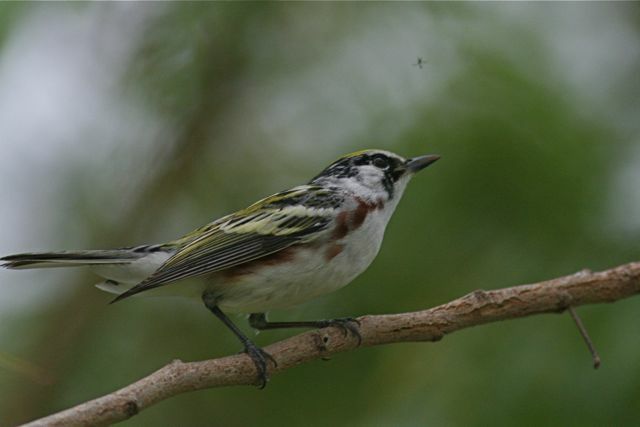 Chestnut-sided warbler about to nail the insect above it (look closely). This blackpoll warbler looks like he's moonwalking. When the rains come, they run and hide their heads. The end of our Big Sit on South Padre Island was hastened by the rains which arrived late in the afternoon and brought a dark, wet, windy curtain down on an otherwise fabulous day. We finished with 127 species. It looks like we did not win the Big Sit category for the Great Texas Birding Classic, but we certainly are the champions in the category of Most Fun Had Inside a 17-foot Diameter Circle. This was my highest Big Sit total ever. We set a new Big Sit record (127) for the location of our Sit, the South Padre Island convention center, beating the record of 124 set by another team last year. I believe we saw and heard at least 300 dickcissels. Ben Lizdas of Eagle Optics, the team's co-sponsor, got a life bird: magnificent frigatebird. The tie-dyed shirts I made for the team with anis stencilled on them were a hit (team photo coming soon). We ate like pigs, slept barely a wink, and laughed in the face of the elements. Oh and we saw some totally ossum birds (more pix of them coming, too). Yes we are still here, birding our badonks off, trying to avoid the mid-day sun, and listening to rumors of a three o'clock front which might drop some birds in our proverbial laps. It's been an outstanding morning (and for those of us who have been up since the midnight start it seems like late afternoon now). We are at 103 species. Last one added: a flock of about 30 cedar waxwings. I've tried to take a few bird shots today. Hard to do when the birding is fast and furious. Several times this morning we've had four or five species in one tree. And more than once we've had five or six individuals of a single species in a single spot. Pyrrhuloxia male: a good bird for South Padre. Adult blackpoll warbler. His yellow slippers are showing well. Just after 2 am and Jeff, Liz, and I have 20 species, mostly by ear. Just added: black-bellied whistling duck and upland sandpiper. Hundreds of dickcissels going over tonight. More soon! I caught Billy Bragg shows several times in the mid-80s at the Lone Star Cafe in NYC. He remains one of my favorite singer/songwriters—nothing flashy, just good melodies and lyrics that make you think. Participants in the 2007 Big Sit at Indigo Hill. This weekend I'll be participating in The Big Sit category of The Great Texas Birding Classic on a team composed of some birding pals from hither and yon. Bird Watcher's Digest and Eagle Optics are the sponsors of our team, which is named The Groovy-Billed Anis. We'll be sitting near the convention center on the northern end of South Padre Island. It's a great spot with brackish marsh nearby and the Gulf of Mexico too, plus a line of trees surrounded by sand, making them into a veritable oasis for migrants coming off the gulf. Last year the winning Big Sit category team had 124 species from this very spot. We're hoping to beat that this year, if the birding gods be with us. I've done one other Big Sit in Texas (where everything is bigger) also during the GTBC way back in 2003. Our team, The Couchless Kingbirds, had 92 species and finished in the middle of the category pack. Team members for that year were Jeff Gordon, Liz DeLuna, Jim McCormac, and yours truly. We chose the dike wall outside of Bentsen State Park as our circle location—something that baffled the Border Patrol officers who drove past during the night. It will be fun to have nothing else to do for an entire day except watch birds. I'll try to offer some updates here at BOTB if I can get Internet access. We'll start Saturday night, April 26, at midnight and we'll end sometime late on Sunday night. The competition ends at midnight. The really cool thing about the Great Texas Birding Classic is that each team that wins a category, gets prize money to donate to a conservation cause of their choice. That concept, and the fact that we're sitting—not racing all over in an SUV trying to find birds—makes The Big Sit category of the GTBC a fairly green option among all the competitive birding events that are held each year. Comprising the Groovy-billed Anis, you will find the following people: Jeff Gordon, Liz Gordon, Ben Lizdas (Eagle Optics), Marci and Terry Fuller, and moi (Bird Watcher's Digest). I'm hoping the skies are full of warblers, orioles, tanagers, and painted buntings! Wish us luck! 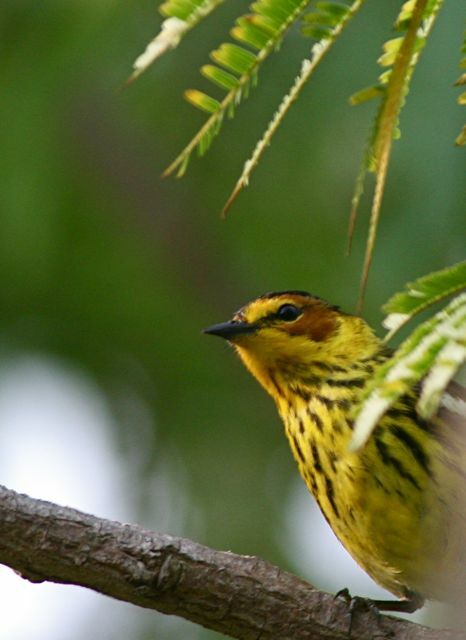 Yesterday's most exciting arrival at Indigo Hill, our SE Ohio farm, was a male prairie warbler. He sang half-heartedly from the lower edge of the meadow, almost exactly where I took this photo of him last spring. Phoebe and Julie and I were walking up from the east valley along the old logging road, scanning for morels, spring wildflowers, and box turtles. The only category for which we had any success was the wildflowers: Julie spotted some rattlesnake orchids. Slogging up the muddy path toward the meadow, our ears were suddenly filled with the rising chromatic notes of a male prairie warbler. Julie coached Phoebe with this clever tip: "It sounds like a tiny water bottle being filled up." Clearly Phoebe got this analogy judging from the "ah-ha!" look on her face. I'll bet she remembers this audio clue the next time she hears a prairie warbler. And she should be hearing this male singing from now through mid-July right on our farm. The first robin of spring! Everyone, it seems, has been waiting for spring to finally, well, spring. Here in SE Ohio it finally did today with a bunch of obvious signs. First, there was the mythical First Robin of Spring! We have robins all winter long flying over the farm and in our woods. But that does not stop us from gushing and pointing and proclaiming the arrival of TFROS. Colt's foot has been in bloom for about 10 days and is now starting to go to seed. This hearty wildflower grows along roadsides and seems to thrive in areas of disturbed soil. It comes up in early spring without fail, just when you think you'll never see another blooming flower ever again. That high-pitched whining sound you're hearing at night from the roadside ditch is the love song of the American toad. The male toad trills away on warm, wet evenings, hoping to lure a female into range so he can jump on her back, fertilize her eggs, and make more little toads. These toads, captured en flagrante, are temporary residents of our backyard pond. Once the deed is done, they'll head back to the woods where they live, hoping to avoid broad-winged hawks by day and barred owls by night. I, for one, am glad the wait for spring is over. Now I must steel myself for the warm weather ahead and for all the delectable birds that will be riding in from the south on the warm fronts. 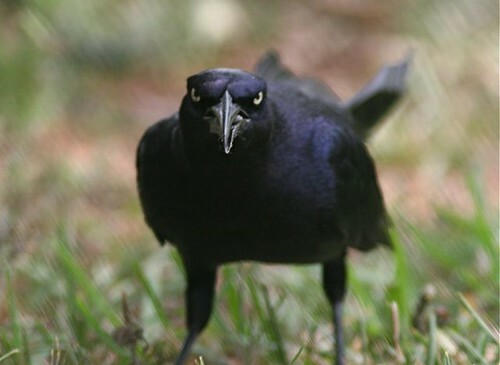 Oh, the hated brown-headed cowbirds are back. They return in the spring just before the songbirds that they parasitize so thoroughly. Here's a male (right) and female hoping to fatten up on cracked corn in our side yard. I won't recount the entire natural history of the brown-headed cowbird, except to say that they evolved following roving herds of bison, eating the insects these large mammals kicked up. Being constantly mobile, cowbirds could not afford to build a nest, incubate eggs, and raise young. So they adapted to let someone else do all the work. Female cowbirds lay their eggs in the nests of other birds. They are amazingly good at finding hidden bird nests and waiting until the coast is clear to slip in and make an unwanted egg deposit. Two weeks later the "foster" parents are raising a youngster that is not their own (and probably arguing over whose side of the family the nestling's ugliness comes from). If it weren't illegal and bad for the soul, I'd consider doing something to control this species. Cowbird control measures have resulted in increased reproduction by the endangered Kirtland's warbler in Michigan. Every year here on our farm we see fledgling cowbirds and it makes me heartsick to think of the wood thrushes, blue-winged warblers, and indigo buntings that were fooled into raising them. One species that never has to raise cowbirds to fledging is the American goldfinch. Their nests get cowbird eggs to be sure, but the nestling cowbirds cannot survive on the goldfinches' all-seed diet. Instead of "offing" cowbirds, we'll quit feeding so much corn and mixed seed (which the cowbirds love) and we'll curse these parasites whenever we see them. Blending in to the birch trunk was a young female yellow-bellied sapsucker. On a recent winter's afternoon, The Zick and I were standing in her studio looking out at the feeding station. I was telling her about the pine warbler that had visited the day before, while she was out of town. Just then a woodpecker hitched around the side of the mostly dead birch tree just a few feet from the studio window. It was a very young female yellow-bellied sapsucker and she was striking for her utter lack of color. Her plumage was composed of black, white, and grayish feathers with almost no sign of a sapsucker's telltale head or throat coloration. There was only the slightest hint of a yellow wash across her breast, but you had to strain your eyes to see it. The gray winter day, the duotone tree and bird, all made for a pleasingly limited palette. The female sapsucker had very little color on her. Suddenly the feeder birds scattered and the sapsucker whipped around the back of the birch trunk in a flash. A blue-gray missile came shooting past the window—the adult male sharp-shinned hawk we'd had around all winter. The sharpie flew straight toward the sapsucker, banking sharply to swoop around the trunk just inches from the sapsucker. The accipiter missed the sapsucker, and did what most bird-eating hawks do near feeding stations: perched nearby to wait for things to calm down and for an unsuspecting songbird to move. We were astonished at how fast this all happened—in just seconds. But we dared not move lest we scare the sharpie, or worst, scare the sapsucker into moving and giving the sharpie another shot. The sharpie stared holes in the birch trunk. The sapsucker held fast and motionless on the back side of the trunk, one eye peeking at us as if to say "Please don't tell him that I'm here. I'm just a boring old stub of a tree branch on this boring old birch. Pay me no mind." The hiding female sapsucker held tight and motionless to the birch trunk. Soon the hawk tired of waiting and moved off into the woods, no doubt looking for less wary victims. For us it was high-five time. Male sharp-shinned hawk waiting out the sapsucker. In the movie Jeremiah Johnson, the character Bear Claw Chris Lapp (played by The Waltons' grandpa Will Geer) says "Winter's a long time going. Stays long this high." The old mountain dude was totally on the money with that one. He could have just as easily been talking about this endless winter we're enjoying. I am ready for warblers and spring. 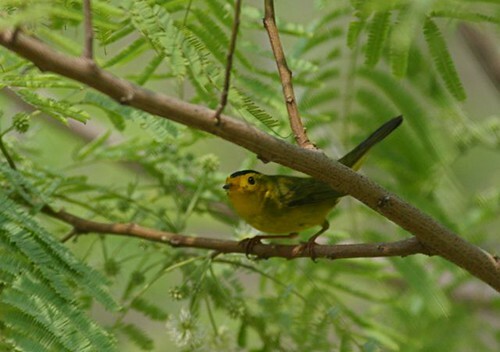 So far here at Indigo Hill, we've had exactly TWO warbler species in 2008. Yellow-rumped and pine. And it's April 15! No ovenbird yet. No Louisiana waterthrush. No palm warbler (but hey, our palm trees aren't fruiting yet). Here are a few images of the (notice I said THE, as in the ONLY) pine warbler we've had so far. He stopped by, attracted by all the activity at the feeders, and helped himself to a few peanut bits, some sunflower hearts, and a few bill-fulls of suet dough. Then he split for points north. It's hard to be patient for spring's arrival—and it seems to get harder each year. Male pine warbler checking out bark cracks and sapsucker holes in a birch trunk for insects. Sneaking closer to the bird feeders. Dispatching a sunflower heart. Pine warblers survive cold weather by sheer resourcefulness. This afternoon, while doing a bit of birding at Magee Marsh State Park along Lake Erie with some fellow OOS members, I captured a few frames of a het-up male ruby-crowned kinglet. He was singing and displaying to a nearby female. Check out the image captions for a description of what was happening with this bird. Curious at our spishing, the male kinglet came closer. Then he leaped off the branch and disappeared into the thicket. This was my best look EVER at a male ruby-crowned kinglet's crown. I got a few other frames which I share here in the future. Lots of new arrivals here in northern Ohio, today, including Louisiana waterthrush, barn swallow, rough-winged swallow, and pine warbler. Wow are the goldfinches changing fast this spring! How can this happen that in just a few days, a male American goldfinch can go from this (above) to the buttery yellow, full-breeding plumage in the final image below? Starting to get a few light-yellow patches. Becoming more yellow than drab green. And, finally, the full canary suit of yellow, black, and white. I know these photos are not of the same bird. And this last image is from last spring—I have seen a full yellow male (just yesterday in fact) this spring, but have not photographed one yet. What a stunning spring transformation! It's not surprising that some non-birding folks wonder each winter where all their goldfinches have gone. "I HAD goldfinches (I call 'em my wild canaries!) up until about September. Now all I've got are these drab green sparrows! And they're eating up all the goldfinches' food!" Just got word from the home front that a barn swallow (the first of spring) flew over the yard, calling. Time to start putting out the eggshells that they love so well. Every spring I get "buck fever" for the newly returning migrant birds. I strain my ears to hear the first wheezy notes of the gnatcatcher from the maple tops, the burble of the tree swallows over the meadow, the staccato phrase of the ovenbird from deep in the woods. Today I had the fever bad. As I was returning from putting the kids on the school bus, my reptilian brain lobe registered a new sound—familiar yet unnamed. The bird making the sound only called once. Forty-five minutes later I was working at my desk and I heard it again, then again. "BLUE-WINGED WARBLER!" Right on schedule--well maybe a few days early. But this is not the blue-winged's familiar ZEEE-buzzzzzzz song. It's the late summer alternate song—why would it be singing that? I raced outside with my binocs, camera, and iPhone (to play the bird's song back to it, if need be). Newly arrived blue-wings every spring sing from the tops of the dead ash trees in the orchard. No bird there. And the singing had stopped. Then the thrasher started up again and immediately did a PERFECT blue-winged warbler alternate song. DOH! It makes perfect sense. The thrashers always nest in the same brambly corner of our orchard as the blue-winged warblers. 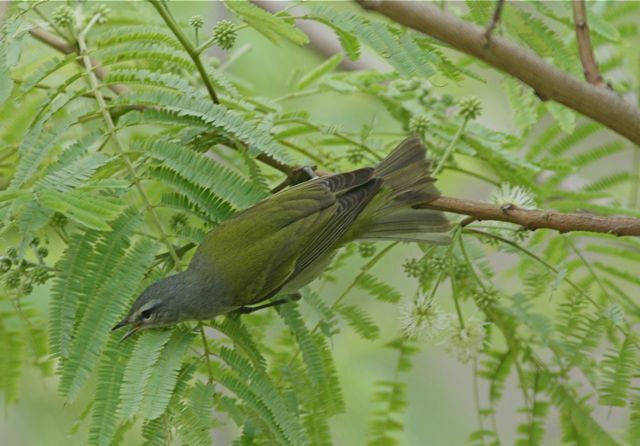 The males of both species sing from the same perches in the same trees. If this thrasher grew up here, he'd certainly have heard the alternate song the male blue-wingeds sing in late summer. So why does the thrasher sing this song here, now, when he's got so many others from which to choose? Does this place inspire him in that specific way? Does he miss his neighbor? Or is it just the fact that he learned it here and lives here that he sings it here? No matter his reason, he surely fooled me. Blue-gray gnatcatcher. Photo by Julie Zickefoose. When I woke up this morning and saw the sun (that unfamiliar bright yellow light in the sky) shining and the maple trees in flower, I knew it might be the day they arrived. And sure enough it was today. Just about the time I was throwing the hotdogs on the grill, and shellacking the kids at a game of P-I-G on the basketball court, I heard the telltale high-pitched, buzzy lisp of our latest spring returnee. The blue-gray gnatcatchers got in today here in Southeastern Ohio. An undeniable sign of spring. Hallelujah! I ran to the house for my binocs and when I came out I could hear the gnatcatcher's call, but at some distance. Where to look? .....DUH! Look in the trees that are flowering. That's where the gnats AND THUS the gnatcatchers will be. Ah! Look there! In the crown of that red maple. It's a male blue-gray and he's looking natty! Happy spring to you, my fellow bird watchers! May a gnatcatcher soon arrive to catch your gnats. If you are a member of a bird club, have you noticed the utter lack of new, young members joining up in the past decade or so? My bird club certainly has. We are as gray as a winter sky. There simply isn't a crop of young nature enthusiasts coming up, interested in belonging to a club of like-minded souls. Because kids today have a million other things vying for their attention and a red-spotted newt or an American redstart has a hard time competing with the latest Wii game or a TV loaded with 300 channels. To promote The Young Birder's Guide, I've been giving my "No Child Left Inside" presentation, and I'll be giving it more in the coming months. In the talk I discuss how many of today's youngsters are suffering from a "nature deficit disorder" because they spend all of their time inside, on the computer, watching TV, talking on the phone, or playing video games. The only outside time they get is during recess at school or during organized sports activities. That's hardly a connection with the natural world. Richard Louv, in his best-selling, fascinating book Last Child in the Woods, was one of the first to identify this unsettling trend of kids growing up with no connection to the natural world. If this trend continues unabated, we as a society may face some unfortunate consequences in the future. Studies have shown that children with little or no exposure to nature can develop both emotional and physical problems. Indoor-only childhood time can result in troubled kids. Furthermore, if today's young people don't know and love nature, whom can we rely upon to be interested in the protection of the natural world in the future? To know something is to value it. And if you value it, you are more likely to want to protect it. I could go on talking preachily about this topic for an hour. Other adults and organizations are getting involved, too, which is reason for hope. The Boy Scouts of America has redone its bird watching merit badge. The American Birding Association and Leica Sport Optics continue to sponsor youth birding team called the Tropicbirds. Here in Ohio, the Black Swamp Bird Observatory operates the highly effective Ohio Young Birders Club. I am no evangelist, but I DO feel strongly about giving kids an easy entry to discover the world of birds if they want to. I'm trying to do what I can by giving my talk on this subject as often as possible. Two upcoming dates where I'll be giving the "No Child Left Inside" presentation, in case you're interested, are Saturday April 12 at Lake Erie Wing Watch in Huron, Ohio, and Sunday, April 13 at the Harvard Museum of Natural History in Cambridge, Massachusetts. If you can come, please do, and bring a young birder with you! Saturday, March 8, Kearney, Nebraska. Care to guess at how many species are in this photo? I've seen some skies full of birds in my lifetime of birding, but I'm not sure I've EVER seen a sky quite as full as this one. East of Kearney, Nebraska, near the famed Platte River migratory corridor for waterfowl and sandhill cranes, we came upon a gravel quarry absolutely filled with geese. The birds were resting on the water and on the islands between the quarry ponds, literally covering the surface. The noise of all those birds calling was the very definition of ear-splitting. We had no idea how to estimate the number of birds present, but it seemed like several hundred thousand—and perhaps more than half a million. Mixed goose flock containing Canadas, cackling, snow, Ross', and greater white-fronted geese. We went back the next day and the flocks had almost entirely moved on to some other place. Ephemeral spectacle. After 37 years of near obsession, slack-jawed wonder, and thorough enjoyment of birds, I have decided to hang up the binoculars. I just don't feel like being a birder anymore. My new hobby (and I am really jazzed about it!) is collecting paper clips: all colors, shapes, designs and countries of origin. If you know of any cool paper-clip collecting festivals please let me know. I'm even thinking about writing a book to encourage young people to come inside (it's dangerous outdoors!) and get into the really awesome fun of paper clip collecting! Well, it's been fun! Gotta dash, my new job at Staples starts tonight at midnight.